Kinetika pitched to our Partnerships Panel, and our Cultural Connectors agreed to support and were excited to be part of the ambitious Silk River project. Barking and Dagenham was one of ten locations along the river Thames who were connected up with ten locations along the River Hooghly in India. Starting with open workshops in February 2017 the project quickly grew and we worked with an Artist and Artist Facilitator, Susanna Wallis and Saira Awan, both of whom live and work in the borough and are established practitioners, to collate and gather stories from individuals and groups across Barking and Dagenham. Inviting everyone to share their own connections to, and experiences of the River Roding and River Thames. Susanna and Saira’s journey took them from St Margaret’s Abbey in Barking, past artist studios, green spaces, industrialised hubs to brand new developments on Barking Riverside. Meeting many generations along the route and gathering stories and imagery capturing the past, present and future relationship the community have with the river. All of this vibrant history, stories and ideas were transformed into illustrations and the design for the B&D scroll. The Silk Scroll residency at Kinetika Studios introduced our artists and many members of the community to a completely new technique, Silk Batique painting. New skills that were shared at THAMESFEST as well as some very enthusiastic and creative schools. Each of the 20 scrolls from the UK and India came together to parade from Kew Gardens to Southend on Sea as part of the Totally Thames Festival. 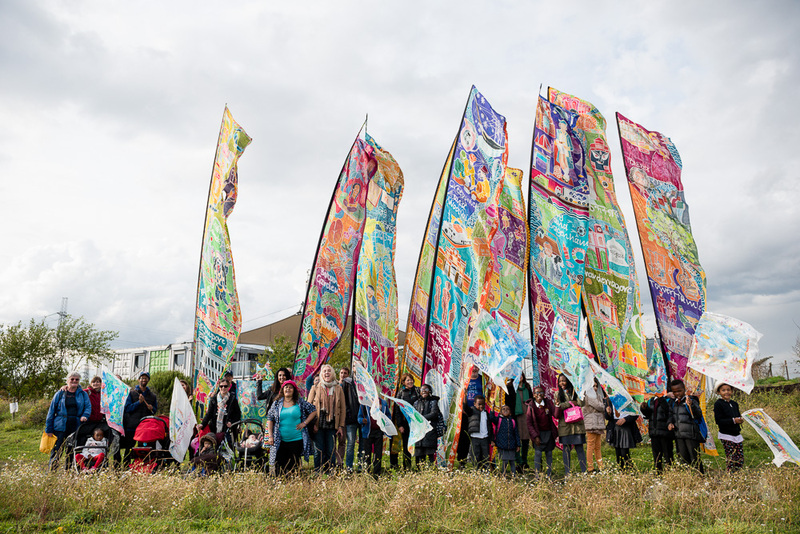 They visited Barking on Monday 18th September where locals and those further afield joined a walk to hear about the stories captured on the scrolls. Visiting the history at St Margaret’s, discovering The Boathouse and a trip down the River Roding to Studio 3 Arts and Greatfields Park. We heard from Cultural Connectors Danny and Catia Baxter as they shared their poetry over lunch at the Sue Bramley Centre. We raced Cardboardia boats as we had done at THAMESFEST at the Rivergate Centre before finishing our walk and waving the scrolls off on their way from Barking Riverside. All images: Jimmy Lee. From the Barking and Dagenham walk that took place on Monday 18th September 2017. The final stop at Barking Riverside. Image: Jimmy Lee. The scrolls have gone on to be exhibited at Kew Gardens and taken on their indian adventure, you can epxlore their journey with the brand new video, created by Mandakini Menon here. They will be exhibited in various locations throughout 2018 so be sure to follow us on Facebook and Twitter for updates about where to see the scrolls. A massive THANK YOU to everyone who volunteered and played a part in sharing your stories and creating the scroll. Thank you to all of those organisations who hosted us on the day and helped us celebrate and bring alive the Barking and Dagenham Stories along the river. A few special mentions and THANK YOUs to Susanna Wallis, Saira Awan, Joan Bullivant, Johnny Paterson, Jim Albert, Matthew Benjamin, Deepa Saduha and Community Concord, Jeorgina Soares, Melody Cohen, Danny Baxter, Catia Baxter, Khushnood Ahmed, Alison Cormack, The Boathouse, the volunteers at St Margarets Church, Marian and Don and The Friends of Greatfields, Wumi Oyewole, Kerry Griffith, Susanna Bruce, the Studio 3 Arts team, Peter and the LDWC team, Tracey and everyone at the Sue Bramley Centre, the Marsh Green Drummers and Mathis Richet, the LBBD volunteers, Jimmy Lee, Frank Donaugh, Ann Dineen, Steven Lawes, Helen Ball, Melissa Lowndes, Pilar Costa, the Rivergate Centre and George Carey School, Varsha and the Barking Riverside team, the brilliant Kinetika Team and all the visitors and attendees to all the walks across ten unique days in September.